"The hard truth is, every organization is facing complex social problems that they can't solve on their own. The good news is, every organization can build networks that will help them create solutions together. Connecting to Change the World is the must-read manual that will teach you how to put this strategy to work if you really want to make a difference." 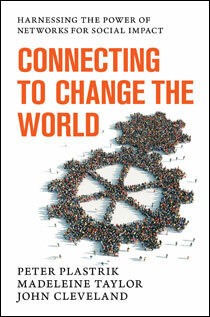 The Summit Foundation and Island Press are pleased to offer you a complimentary copy of Connecting to Change the World, the essential guide to building networks for social impact. Drawn from the authors' deep experience with more than thirty successful network projects, Connecting to Change the World provides the frameworks, practical advice, case studies, and expert knowledge needed to build better performing networks. Authors Peter Plastrik, Madeleine Taylor, and John Cleveland offer an accessible, informative guide to creating strong alliances and collaborative solutions to tackle the most difficult challenges. To receive your e-book, please submit the form below. Your e-book will be sent to you within two business days and must be downloaded within one year of receipt. Your complimentary copy is made possible with funding by the The Summit Foundation. This offer is exclusively for you-please do not forward this page.